Also known as pincer bugs, earwigs have long black bodies with a pair of pincers (forceps) attached to their abdominal area. Found in moist crevices outdoors and in gardens, earwigs are nocturnal yard pests that eat other insects and plants. Earwigs make small, irregular holes in plant leaves. If you do not seek out pest control for earwigs, they can tear all of the leaves off plants, ruining the garden and landscaping at your home or office. 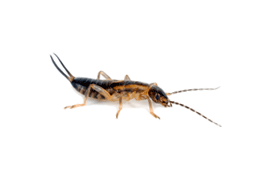 Quarterly pest control service packages help to control your earwig population. Quarterly pest control packages from Knockout Pest Control give you a year’s worth of maintenance as well free pest control services between quarterly visits. The primary benefit of having a pest control maintenance plan is that you are guaranteed all year pest control. If you have a pest infestation included in your maintenance plan between our scheduled visits, we come out to resolve your pest problem, free of charge. It’s as simple as that, we guarantee control.